Recently I read a couple reviews of the Jamie Wyeth retrospective at the MFA in Boston that were critical of the show, the main point being that his work as a whole lacked a unifying purpose, that he was technically exceptional, but without the capital A in Artist. Wyeth had a range of styles, including expertise in the Wyeth family way, but I see this range as potentially representative of an exceptionally talented artist trying to find his own voice among the many he can channel, and sometimes that challenge can be more meaningful than the challenges of one who clearly has his own voice. I see it as representative of this larger human struggle to understand ourselves and our own potential. I wonder about my own art. I have neither the skill not potential of any Wyeth, but that isn’t the point. I, like anybody else, am just trying over time to figure things out. Painting happens to be a pretty fun and phenomenal way to do that, being useful and influential beyond just the problem of conveying and conversing visually. 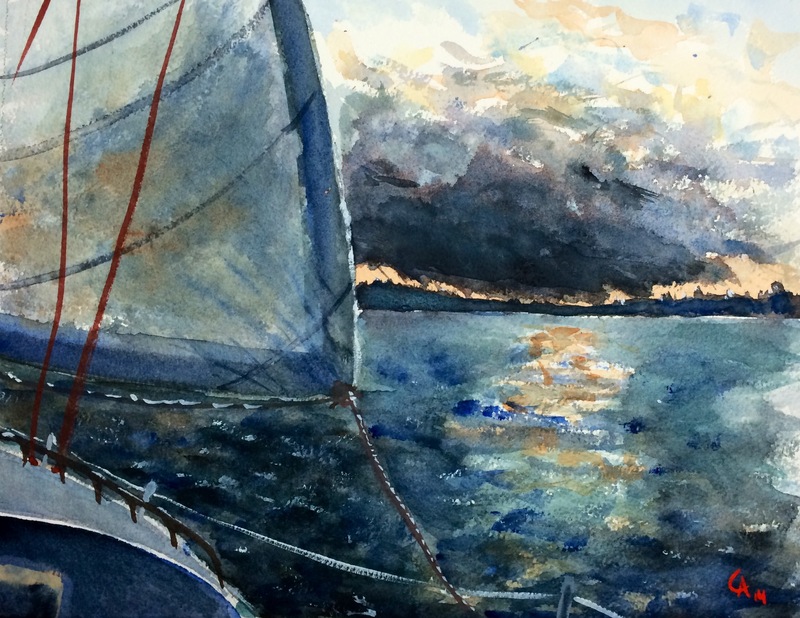 Here, in this sailing painting, I am working through a style that I have been pursuing over this year–one of somewhat rough brushwork, of materiality in watercolor. Watching the Wyeth Inferno video at the exhibit and also available on YouTube got me comfortable being more aggressive on the brushes–Princeton Neptune faux squirrel brushes happen to be great for this because they are high quality but very affordable, so you can really mess around without worrying about wrecking them. You don’t need them to keep the point, that’s what the sables of stuff synthetics are for. 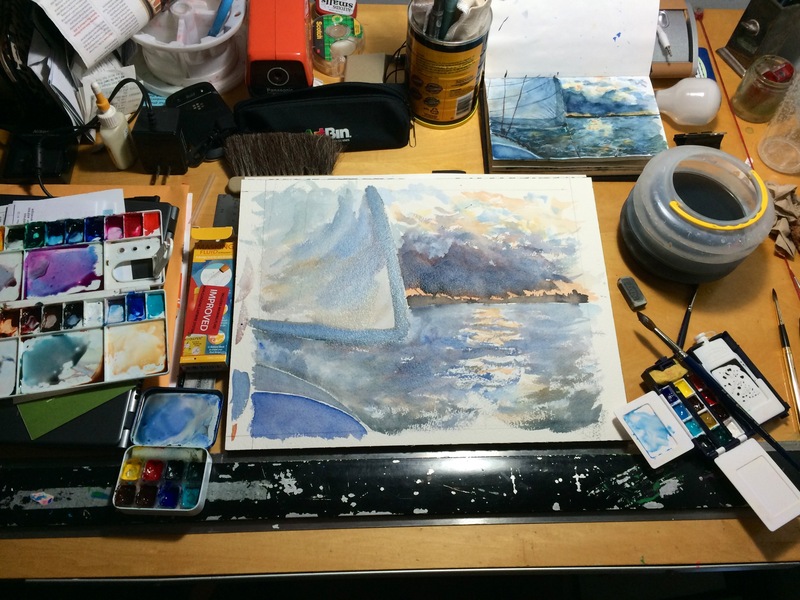 You can see my work on the sail especially comes from scrubbing the brush into the paper, letting it dry out. I like showing that I used a brush, letting some of the effort come through because that also makes the work more interactive, more conversational–or at least I can pretend it does. Part of the narrative about Jamie Wyeth is a son trying emerge from the shadow of his father. Another part, as Andrew Wyeth put it, was a competition. Andrew Wyeth said in his biography, “When you get fame–you see, I’m in competition with my son whether I want to be or not. Just the fact that I exist as a painter.” I don’t like either of these characterizations. I prefer not in the shadow of, or in competition with, but in conversation with. 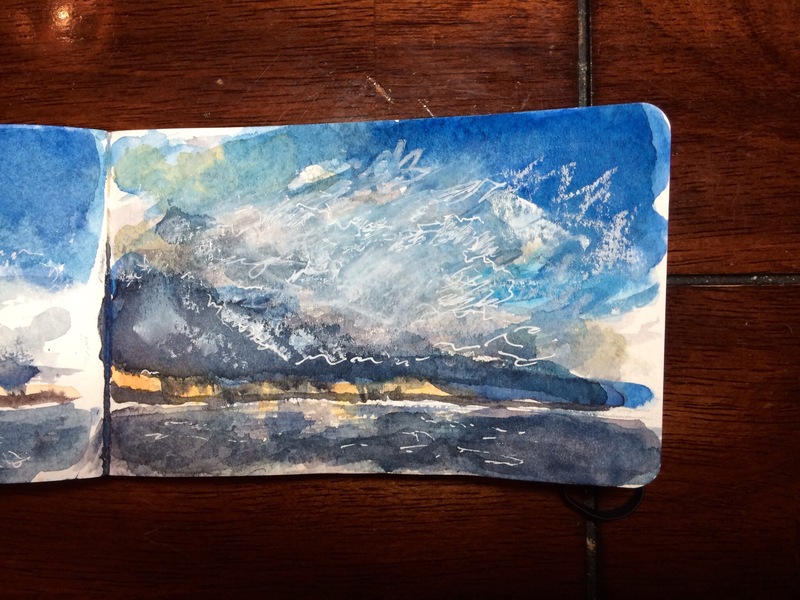 Over this summer I did a sketchbook painting of a stormy sky over Annapolis while sailing with my brother. 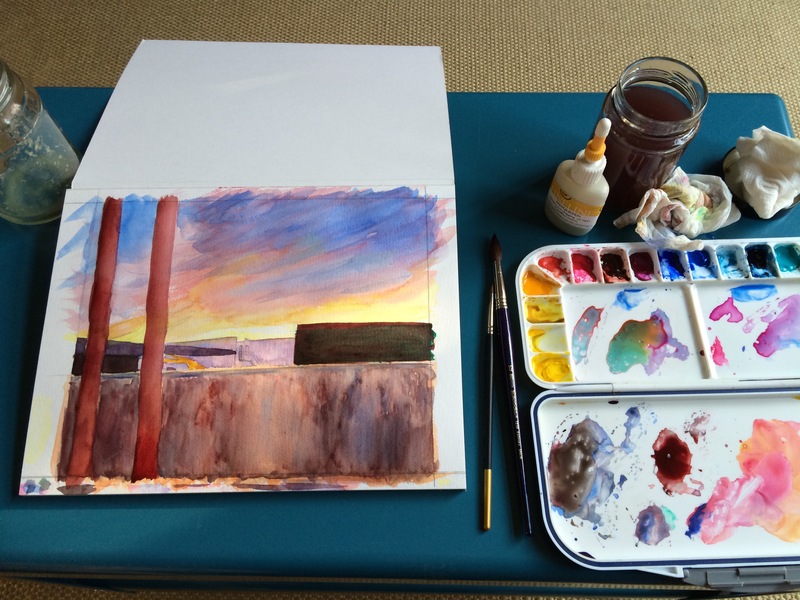 This morning I started a larger painting of it from the sketch. I stopped here to let it dry before I darken most of it and put in the rigging. I want to have more contrast in this one than the last, which I thought was too dark. I will return to it another day. Time for breakfast. This morning my younger daughter and I spent some time painting together. 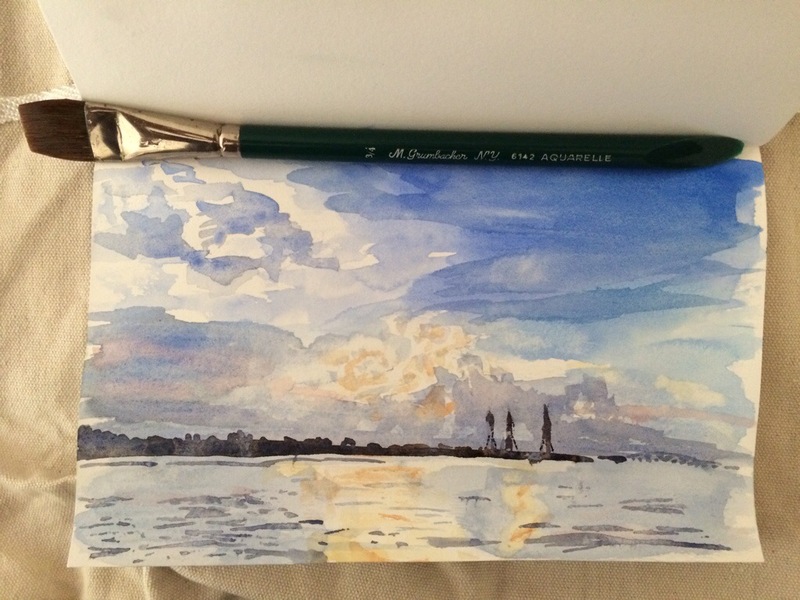 She’s into doing color studies like Turner (she said so!). I thought of doing a sky study while she was working. This is what I came up with to try working exclusively with a 3/4 inch flat (an old grumbacher sabeline my dad gave me). I am getting ready for another trip to Lakeville, MA to visit my aunt and hopefully paint a lot. The skies are really beautiful there. Painting opportunities have been few and far between recently (for good reasons). I need some warmup time before I go. This is from a photo I took while sailing in Annapolis. Here’s another sketch from my sail a couple weeks ago. 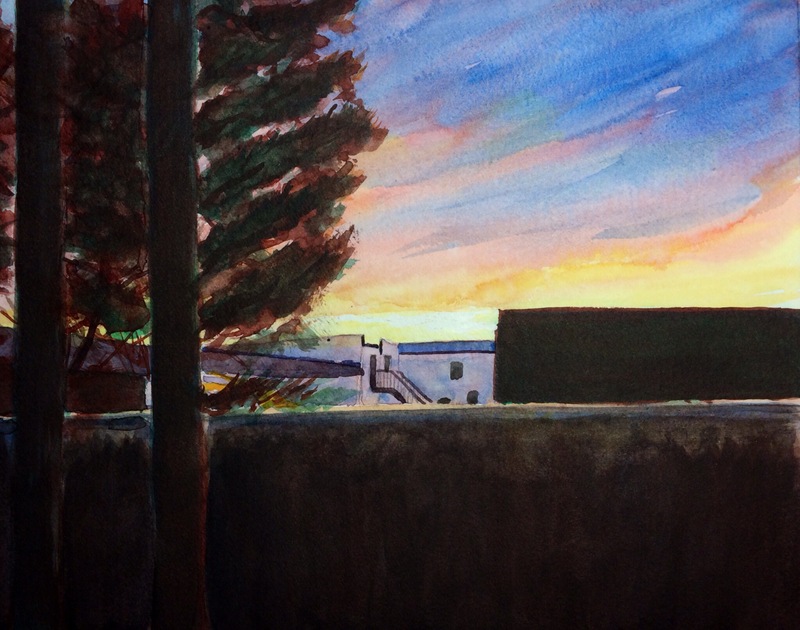 I did this with my compact kit in a Stillman and Birn Alpha sketchbook. 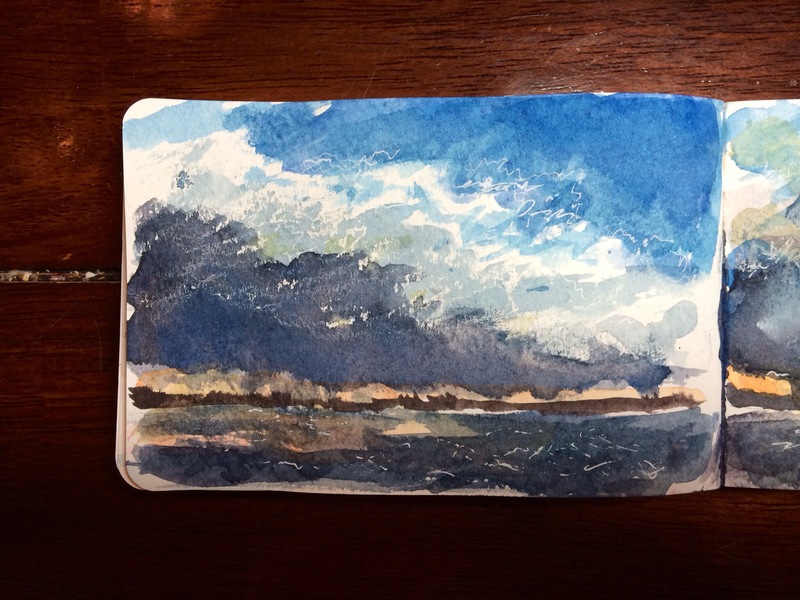 While it buckles more than the moleskine watercolor sketchbook, the paint seems to behave better with a bit more life. I think I will work this one up into a larger painting later. There’s some good potential here, with a feeling of really being part of the action. On Saturday we went sailing. As we got out in the bay, a brief storm came up over Annapolis. We stayed far enough out that we didn’t get rained on, but it afforded us some incredible views of the sky. I didn’t paint them at the time but got a lot of good pictures to make some studies of. I tried also to take a lot of photos to study the way light and color work on the water, and how different size waves take on light. I plan to work up some studies of these as well. There are so many different approaches to capturing these effects, from the brush-strokes and opaque colors of John Singer Sargent, to the photorealistic approach. Each has its merits. I want to explore each, and will likely do so with the same scene sometime soon. For now here are some quick sky studies before I work these up into larger paintings. It was a rich outing this weekend. I can’t wait to get painting. These are of the same scene, just with different quick techniques. In both I tried using white crayon as a resist. In the first I didn’t press hard enough, so came back in with a white gel pen and white watercolor pencil. In the second the resist worked better. I also drew out some highlights with the gel pen. In both what I was going for was a rapid way to get an impression. I think I rushed my actions in the effort to finish quickly. I need to be calm about it. The first one felt like a screw up when I did it but now I think I like it more. I learned a lot from these. I didn’t have much left to go on this one, just putting in the branches and darkening things a bit. I will leave this as is for now. Perhaps I can do a bit more in the upper right to darken that and focus things further but I want to post it now as is. My verdict so far on the Fluid paper is that it’s too smooth and after a while I feel as if I am wiping paint off as much as I am putting more on as I glaze. I should have handled this more directly anyway. The sky was quick and most compelling. I just wasn’t sure exactly how to get the fence and tree dark enough with enough variation without glazing. After awhile of it I got impatient and just tried to get it darker and darker since it was most interesting as a framing device. That’s all for now. I have some new experiments to undertake shortly. Here it is. I spent the morning laying in washes and the sky for this sunset picture over Annapolis’ Design District. Like I said in my last post, I like the arrangement of shapes and angles that are broken up by the pines on the left and the light against the clouds. Here’s where I am so far. More to go darkening the trunks with some alternating glazes of green and maroon like the structure on the right. The fence will go darker as well and I have some details to put on the warehouse. I like where this is going.